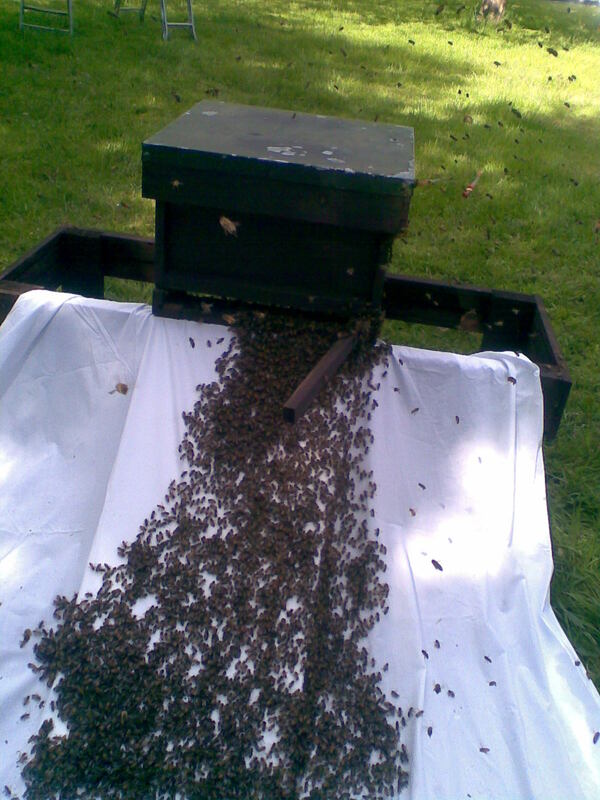 The attached image shows one of the most beautiful sites in beekeeping, a swarm entering a new hive up a ramp covered in a white sheet. Sadly this swarm decided not to stay and moved on. With the continued improved weather the bees had been active since the last inspection. Hive 7 for the first time in several visits had increased, although there was evidence of many queen cups. Hive 2 continues to thrive and appears to be calmer than earlier in the season, it now has two supers. For the third week running the colonies in hives 4 and 5 were the focus of attention. Firstly hive 4, the colony was moved into a full size hive from the Nucleus box. Most beekeepers have to carry out this activity at some time or another and generally it is the first thing a new beekeeper will do on taking delivery of their initial colony. The Nucleus box is moved to one side on the stand and a new hive comprising floor and brood box is placed in the original location. The brood box has enough new frames to fill the box following the transfer from the Nucleus, in this case 6 frames were place in the brood box with space for the five Nucleus frames in the middle. The frames from the Nucleus were placed in the space in the same order and orientation as they were in the Nucleus box ensuring that the queen in on one of the frames moved. We then placed an empty super above the queen excluder and brushed/shook the remain bees into the hive. Replaced the roof and left the bees to settle in. Hive 5 had 3 sealed queen cells the smallest one was torn down and the hive split into two, that is one frame with queen cell plus three frames of brood and stores were placed in a Nucleus Box on stand 3 and the remaining frames in Hive 5 were closed up. In 10 days will need to check these colonies for laying queens. 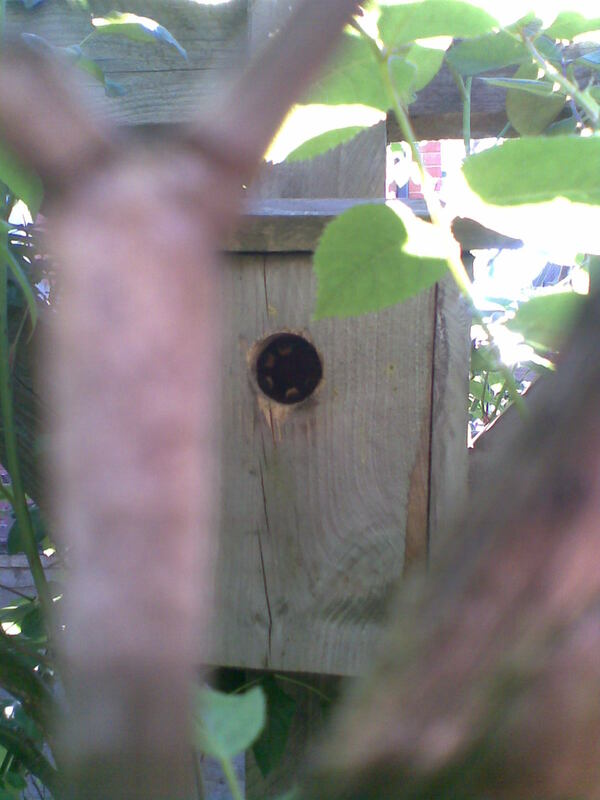 A friend rang yesterday describing what appeared to be a honeybee swarm, it turned out to be Bumblebees nesting in a bird box. Does the entrance look similar to the previous oil can post? Note the guard bees surrounding the entrance. How do I hive this swarm? I collected this swarm today, easiest one ever as it was already housed in a 5 gallon plastic oil can. You can just make out the screen of bees in the entrance forming the colony cluster. If you have a photo of an interesting swarm and would like it added to our Blog please send it to apiary@mbbka.org.uk along with a little explanation of the situation. Again another typically (for this year) cold May day driven by the Northerly wind, which again as the wind died down in the evening gave us the opportunity of a training session in the apiary. Hives 2 and 7 had little change from last week, the queens were spotted in each and there were sufficient stores to support the colonies through the continuing cold stretch. Last week we split Hive 5 into two and were unsure as to which hive the queen had ended up in, it turned out to be the Nucleus on stand 4. The queen was spotted and marked, all stages of brood were identified including fresh eggs and the feed topped up. Hive 5 still had a lot of bees and had produced queen cells on two frames, they were calm and well behaved as can be seen in this week’s images. By the next visit the queen cells will have been capped and a view will need to be taken as to the way forward; split colony again, remove some cells and rear queens or just tear down the extras. Also included is a nice picture of a swarm we helped collect this week, the swarm was a cast, much smaller than the prime swarm which would have occurred 8 days previously. There were 6 more sealed queen cells within the parent colony, each of which could have created another cast swarm dramatically reducing the colony population. In tearing down one of the queen cells the virgin queen emerged, quickly captured and passed on to a fellow Beekeeper who had a queen less colony. It is exactly with this in mind that we must decide what to do with Queen Cells in Hive 5 before the queens emerge. You are currently browsing the Mid Bucks Beekeepers Association Blog blog archives for May, 2010.